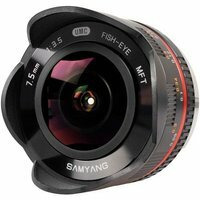 The Samyang 7.5mm T3.8 UMC is a sophisticated, wide-angle fisheye lens designed for cameras with micro Four Thirds sensor. VDSLR Samyang lenses are fitted with racks compatible with the Follow Focus system. This solution allows for effortless and accurate rotation of focus and aperture rings. The aperture ring is rotated smoothly and noiselessly. These modifications allow for extremely comfortable and effective control of focal plane and depth of field during filming. Brightness of the lens corresponds with the T-number of 3.8. To facilitate the reading on the focus and aperture scale, both these indexes are marked in a parallel position to the optical axis of the lens.